The graceful curve of the railroad tracks in any season, because I admire it all the time, is an inspiration to create. In the starkness of the snowy day, the minimized palette honestly black and white even in a photo, the trees rising straight up all around, marching up the steep hill toward the sky and starting down into the ravine on the other side, has been another inspiration I’ve wanted to sketch. I took this photo a few years ago from an overpass and always wanted to sketch it in charcoal. We had a nice snow and when I drove past this spot one day last January I decided that day was the time to do it as part of the January painting challenge. Curving Tracks, Charcoal, 6.25 x 9.5, 2017. The original is framed in a 1-1/2″ solid wood white frame with double black core mats. Digital, giclee and canvas prints are available. I participated in Leslie Saeta’s annual “30 in 30” painting challenge in January 2017. This was my painting for day 5. Read my wrap-up of all my paintings from this painting challenge. 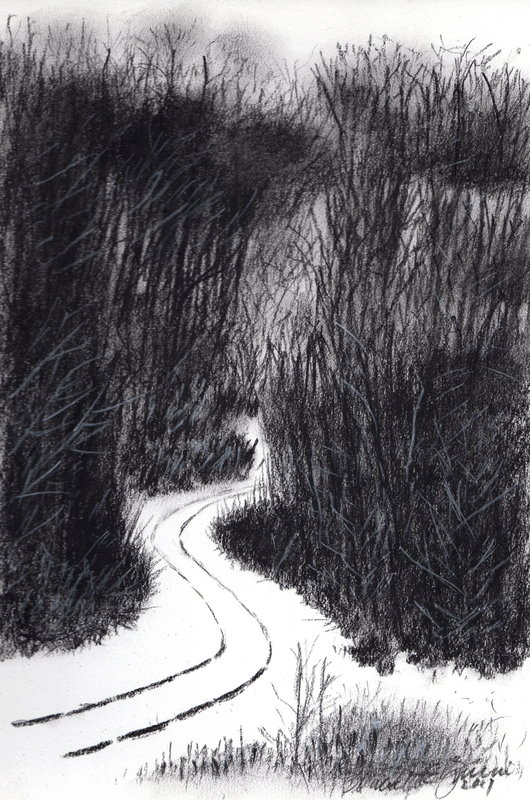 This entry was posted in charcoal, landscapes, nature artwork, original artwork and tagged charcoal sketch, landscape painting, railroad tracks, snow, trees, winter, woods on December 30, 2017 by Bernadette.